Photo used through creative commons license by Chris Shervey. We know you’re the type of traveler who not only likes to visit a destination, but experience it. That means getting to know a region by learning everything you can and maybe seeing some of its quirkier sites. 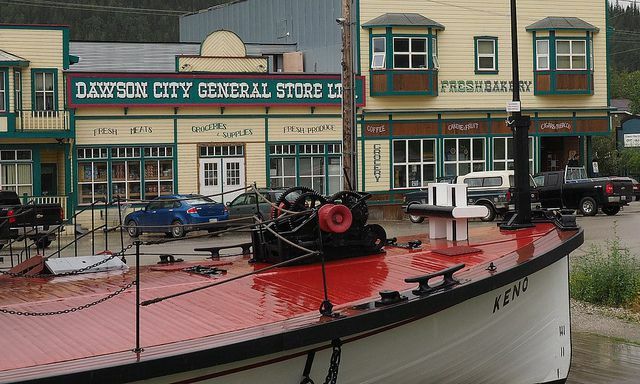 So whether you’ve come to Dawson City for business or you’re traveling on vacation, we’ve got some recommendations and things to do for the best way to get to know the culture, history and character of Dawson City, Yukon. 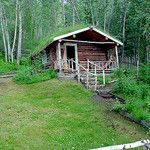 See the tiny cabin on Eighth Avenue where the Bard of the Yukon, Robert Service, once lived and worked on poetry early in the morning before he went to his job as a bank teller. The cabin is furnished with genuine items from the Gold Rush-era, and you’ll see some people from that era, too (they’re actors, really). You just might learn about the secret tales along Arctic trails or queer sights seen by the northern lights that Service was inspired to write about. Service wasn’t the only famous author to live in Dawson City, or even on Eighth Avenue. If you’re a literary type, you’re on the right street: You can also visit the Jack London Museum and see where author Pierre Berton lived. You really can’t leave Dawson City without some gold – that used to be the whole point of coming here. Learn about this thrilling, heartbreaking, and thriving time in Yukon’s history with a Goldbottom Mine Tour. And guess what? You don’t have to wait for the gift shop to find some gold – you get to pan for it yourself! Once you get some experience in proper panning, head on out to Free Claim #6 and try your luck some more. 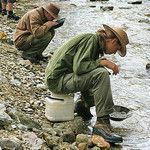 Anyone can pan for gold here and take away whatever they find. Now that you’re a bonafide prospector, spend your winnings at Diamond Tooth Gertie’s, a local gambling hall and entertainment venue in a historic building in downtown Dawson City. Catch one of three nightly cancan shows and get the real turn-of-the-century Gold Rush experience. Yukon wasn’t always about the gold. Learn about the first people of the Klondike, the Tr’ondëk Hwëch’in. Visit the Dänojà Zho Cultural Centre and see performances, view exhibits and take a river walk tour. You also can take home an authentic Yukon souvenir – the gift shop features hand-beaded footwear and hand-made clothing, as well as books on First Nation culture. What better way to get to know the history of Dawson City than from its former residents? 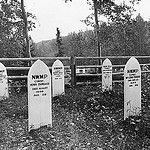 Take a self-guided walking tour of the city’s cemeteries with a handy downloadable guide to teach you about Dawson City’s famous and not-so-famous citizens. Get to know Big Alex McDonald, whose claims produced $8 million in gold. Or Merilda St. Pierre Pepin, whose wooden grave marker now houses woodpeckers. And, of course, there’s Percy “Iron Man” DeWolfe, who earned his title carrying mail between Dawson City and Eagle, Alaska. Try some flash photography and see if any “orbs” appear. Are they the spirits of past inhabitants? Maybe. In any case, we think they’re glad you stopped by. Of course, you can always ask the (current) local residents what they think you should see while staying in Dawson City. We hope you stay long enough to enjoy all it has to offer.